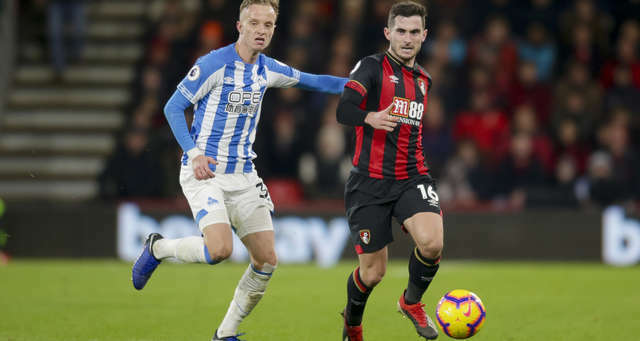 AFC Bournemouth star Lewis Cook said he was making “good strides” in his recovery from injury. Cook is three months into his rehabilitation after rupturing the anterior cruciate ligament in his right knee in December. The midfielder, who successfully went under the knife just days after sustaining the injury, is expected to be sidelined for between six to nine months. England international Cook is continuing his rehab under the watchful eye of the Cherries medical staff during the squad’s mid-season training camp in Dubai. In an interview with afcbTV, the 21-year-old said: “It’s going well. I feel strong and the knee has gone back to looking normal. That was the first bit I had to get sorted. “I’m starting to do more things and have more movement in my knee. I can jog on the spot and am really happy at the moment. “It’s been hard but I feel like I’m getting somewhere now and it’s gone quite quickly. It’s been hard to watch the team play every week but I’m making good strides. “You progress really quickly in the first month and then you start to plateau. My rehab has gone well and everything has been a constant progression. Cook is in good company in Dubai with fellow long-term injury victim Simon Francis working on his recovery programme. He has also received excellent support and advice from Callum Wilson and Dan Gosling, both of whom have fought back from similar injuries. Cook added: “A few of the lads have been through the same thing as I’m going through – Franno at the same time as me. We do a lot of work together. “Dan and Callum are success stories and have great experience of how to get back from these things so I can ask them questions. “When it first happened, Callum told me to get all the frustration and anger out in the first day, the first week and then just crack on and focus on putting everything into my rehab because ultimately I will come back stronger. “Franno has been great. We go through ups and downs and setbacks and progressions. It’s good to bounce ideas off each other and discuss how we’re feeling. Asked how beneficial continuing his rehab in Dubai was, Cook said: “It’s good to have a change of scenery, especially when you’re in the physio room every day. The lads are working hard so it’s good.